By utilizing high speed coilers, Mastercoil Spring has the ability to produce a virtually limitless array of precision Compression Springs. Whether you need Straight, Tapered, Conical, Barreled, - or other unique designs, Mastercoil can meet your requirements. Our coiling area is set up to manufacture medium to high volume requirements with a wire range of .012 - .056 and an OD/ID tolerance range as low as +/- .001. Aerosol, Electronics, Military, Automotive Aftermarket, Sprayers, Toys, Window, Tools, and many more. 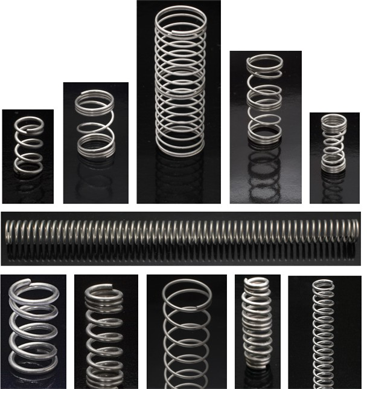 For your Compression Spring requirements contact Mastercoil Spring.